Good isn’t good unless it is shared. It’s a necessity. Whenever we experience something good in life, we must share it with others. The sharing of the good multiplies the experience of the good. Finding out you’re going to have a grandchild is exciting, but sharing the news with everyone is great fun. Hitting a hole-in-one is great, but retelling the story to every golfer and non-golfer you know is most of the fun. Eating a tremendous meal is wonderful, but telling your dinner party about the entrée or sharing your story with others is a vital part of the experience. Good is meant to be shared. While it can be appreciated on an individual level, it finds most of its meaning in the midst of relationship with others. This desire is a tremendous gift to a marriage. It provides an opportunity to have a positive experience with our spouse. 1. Some share with others what should be first shared with their spouse. If your boss promoted you today, who would be the first person you would call? If you heard some exciting news, who would be the first person you would tell? If some minor good happened, who would be the first person you would text? If your spouse isn’t consistently your first person, something is wrong with your relationship. They don’t have to be your first person every time. Maybe they are busy or maybe you have a friend who understands the good shot or good bargain better than your spouse. But, in most situations, if your spouse is not the first person with whom you share good news, then your spouse is not your best friend. When your spouse is not your best friend, the relationship is not as healthy as it should be. Your spouse should always be your first person. When we turn toward others before our spouse, we are robbing our relationship of the necessary positive interactions which a healthy marriage requires. We are investing in other friendships at the expense of our spouse. The first telling is ripe with emotions and excitement that begin to fade with each additional telling. If I tell my friend first and then my wife, my wife will get less of me in the telling of the story. She might get the facts, but she will not get my emotions. My wife deserves me more than my friends, so she deserves to be my first person. This isn’t always possible. Yet as often as I can, I discipline myself to call my wife before anyone else regarding good news. By doing so, I’m investing in my marriage and enjoying the good. 2. Some reject their spouse, not realizing what is being offered. Good is meant to be shared. When we share good, we aren’t just sharing the moment, but also sharing ourselves. Sadly, many couples only hear what is being offered on the surface and do not realize the deeper meaning. When your wife tells you about her day, she isn’t just reviewing the facts of the day, she is revealing her heart. When your husband rewinds the game and asks you to watch a play, he isn’t just inviting you to see the game, he’s inviting you see his soul. When we only hear the surface issue and not the deeper invitation, it is much easier to reject or ignore the issue. What I’m doing in the moment–working, watching TV, reading a book, playing with the children–is often more important than the surface issue my wife mentions. But it is ALWAYS less important than her. When I hear her invitation as an invitation into her life more than a specific issue, I will always choose to listen. Listening will create a positive experience in which she feels heard, understood, respected, and valued. Failing to respond in a positive way–by acting too busy, feigning interest, or rejecting the interaction–will make her feel rejected, unimportant, unknown, and unheard. Enough of these experiences trains a spouse to find a different outlet, other than their husband or wife, to share the good moments with. The necessity of creating positive interactions with our spouses is because the negative interactions are guaranteed. You will have negative interactions within a marriage. Feelings will be hurt. Miscommunication will occur. Misunderstandings will happen. Frustration, confusion, and conflict are an unavoidable aspect of a healthy marriage. Healthy marriages do not have less conflict; they simply have more positive interactions. The negative moments are minimized by the amount of positive emotions and feelings because of the good moments. To give those good moments to friends before we give them to our spouses is to starve our marriages of the very thing it needs to thrive. 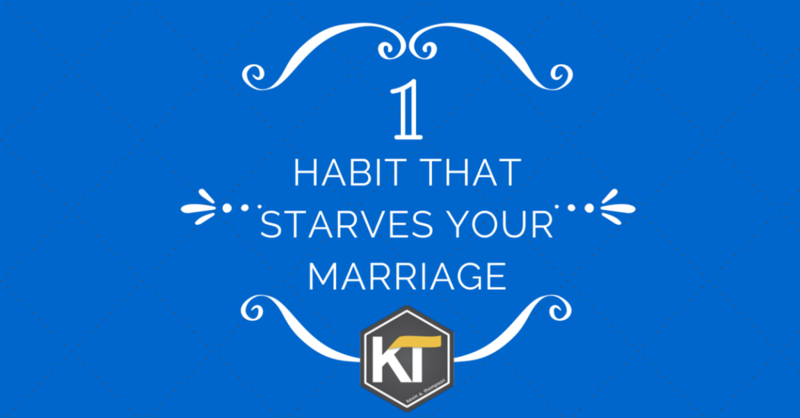 If you do not want your marriage to starve, take intentional steps to create positive moments with your spouse. 2. Recognize when they are trying to create a positive interaction with you. Look past the surface and hear the intent. It’s more about their hearts than the details of the story. 3. When you have a negative interaction, go out of your way to create a positive interaction as quickly as possible. When we have a negative experience with someone, the temptation is to avoid the person. Instead, we should quickly try to reconnect with the person so the single interaction isn’t overblown. Good points to be reminded of. When life gets hectic we need to slow down and appreciate that are spouses are sharing a part of them when sharing interests with us.